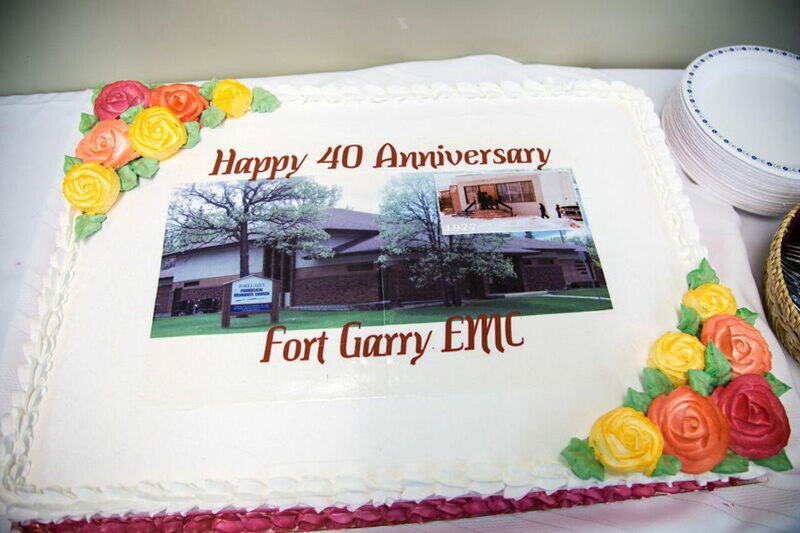 Home » With Our Churches » Fort Garry » Fort Garry EMC turns 40! Fort Garry EMC turns 40! Fort Garry had many reasons to celebrate God’s faithfulness over the past 40 years on Oct. 14 and 15, 2016. WINNIPEG, Man.—From a small Bible Study group, that took a leap of faith and bought a tiny convenience store to worship in, to a mid-sized EMC congregation with attendees from around the world, Fort Garry had many reasons to celebrate God’s faithfulness over the past 40 years on Oct. 14 and 15, 2016. Our weekend of celebration included an evening of reflection and music. Previous pastors, Al Friesen, David Thiessen and Layton Friesen, shared stories and memories of their time in leadership. We enjoyed flashes from the past, through singing praise music from the 70s and 80s and a slideshow of memories. David Kruse, former youth pastor, and his family blessed us with their music. It was a lovely reunion surrounded by memorabilia, refreshments, and decorations for current and former attendees who joined us for this event. Sunday’s worship service included Glen Klassen, one of the founding members, sharing the history of our congregation. Our current pastor, David Funk, spoke and included a story of how God can use weaknesses to make something beautiful. An oak tree beside the church was the perfect climbing ladder for raccoons who had spent many years wreaking havoc in the church attic, tampering with wiring and insulation. Reports by our trustees over the years included the latest adventures of these bandits. Finally, the day came when the only solution left was to cut down the oak tree. The wood from this tree had been dried and at this celebration we enjoyed the beauty of it in the form of a new communion table. David Funk said in his sermon, “On the crosspiece of our communion table, we have the two triquetras (symbol of the trinity) and in the middle, the Aramaic word ‘Maranatha!’ This word could be translated as ‘Our Lord has come!’ or it could be ‘Come, Lord Jesus!’ It means both! Our final 40th birthday song was the full length and full Mennonite harmony version of “Praise God from whom all blessings flow” (known by some as song 606). The future is unknown, but we know God promised to be near us on our journey, as He has in the past.